NEW ORLEANS--(BUSINESS WIRE)--Jesuit High School of New Orleans is the first and only prep school in the United States to deploy a high-tech Germ-Zapping Robot™ to wage environmental war by destroying bacteria and potentially deadly pathogens typically found lurking inside gymnasiums, athletic locker rooms, weight training areas, shower and bathroom facilities, and even personal sports equipment. The germ-busting robot represents a generous gift from Blue Jay alumnus Joseph Authement of the Class of 1997. A resident of Mandeville, Authement is senior vice president of sales for Xenex Disinfection Services. He is a member of the board of directors of the National WWII Museum and Volunteers of America (New Orleans chapter). During his senior year at Jesuit, Authement was president of the Student Council and captain of the swim team. Jesuit’s Robotics Club came up with a clever name for the germ-busting robot: “Morty,” which is a slightly twisted derivative of the Latin word mors, meaning annihilation or death — to germs, of course. The unique robot, a patented product created and manufactured by Xenex, enhances environmental cleanliness by destroying hard-to-kill pathogens, such as multi-drug resistant organisms hiding in places that are difficult to clean with chemicals, mops, and wipes. Morty’s mission will not be confined to providing a regular and thorough decontamination of Jesuit’s gym (known affectionately among Blue Jays as the Birdcage) and the adjacent, heavily-trafficked P.E. facility (Louis J. Roussel Building). Morty will also go to work in other parts of the school, including the Student Commons, cafeteria, auditorium, hallways, classrooms, stairwells, and Jesuit’s two chapels: the newly renovated Holy Name of Jesus Chapel and the Chapel of the North American Martyrs. Morty’s timely arrival to bust germs at Jesuit coincides with a marked increase in the number of high school students in the U.S. who have contracted staph infections while participating in team sports or P.E. classes. Several states, including Louisiana, have reported MRSA infections among high school wrestling and football teams. The problem also regularly challenges college campuses, professional sports teams, and cruise ships. The Xenex Full-Spectrum™ UV room disinfection system works by pulsing xenon, an inert gas, at a high intensity in a xenon ultraviolet flashlamp. This produces intense ultraviolet C (UVC) light which penetrates the cell walls of microorganisms, including bacteria, viruses, mold, fungus and spores. Their DNA is fused, rendering them unable to reproduce or mutate, effectively killing them on surfaces without contact or chemicals. The robot is effective against even the most dangerous pathogens, including Clostridium difficile (C.diff), norovirus, influenza, Ebola, and methicillin-resistant Staphylococcus aureus, better known as MRSA. The robot disinfects in a five-minute cycle, so a single device is able to decontaminate 30-60 rooms per day. Xenex Germ-Zapping Robots are deployed in more than 300 hospitals, ambulatory surgery centers and skilled nursing facilities in the U.S., Canada, Africa, and Europe. Xenex robots have proven to be extremely effective and efficient, and hospitals using Xenex Germ-Zapping Robots have reported significant decreases in their infection rates. Xenex’s patented pulsed xenon UV room disinfection system is used for the advanced disinfection of healthcare facilities. Due to its speed and ease of use, the Xenex system has proven to integrate smoothly into hospital cleaning operations. The Xenex mission is to save lives and reduce suffering by eliminating the deadly microorganisms that cause HAIs. The company is based in San Antonio and backed by well-known investors that include Malin Corporation, Battery Ventures, Targeted Technology Fund II, and RK Ventures. For more information, visit www.xenex.com. 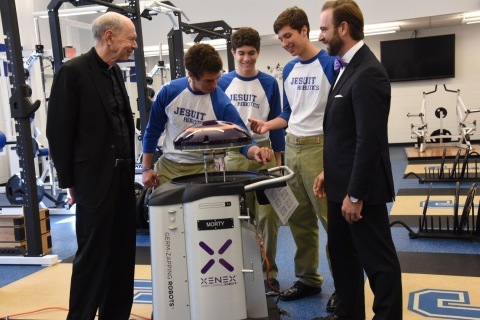 Jesuit High School of New Orleans is the first and only prep school in the U.S. to deploy a Xenex Germ-Zapping Robot™ to destroy bacteria and germs lurking on surfaces in its athletic facilities.